…and the mysterious dissappearace of Elisabeth Luard. It is to Mrs Luard that I owe the slight queazy feeling in my stomach this evening. 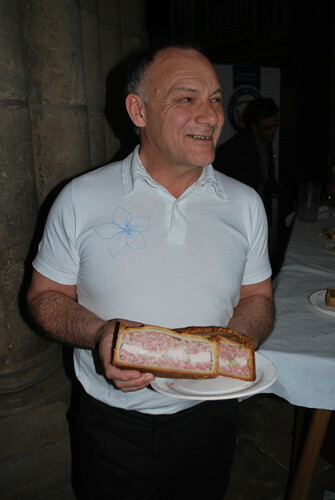 I was invited to be a judge at the second British Pie Awards sponsored by Colmans held in St Mary’s Church, Melton Mowbray. 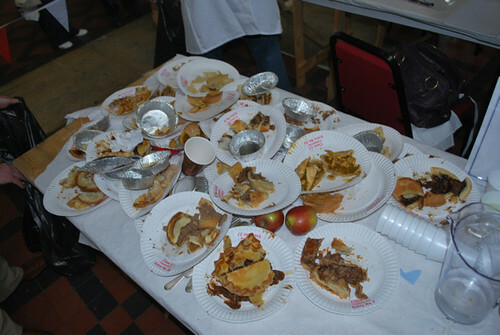 Upon arriving I was duly assigned to judge class 12, Football pies. My fellow judges were George Mount, Proprietor, Roots Farm Shop and Sean Hope Chef & proprietor, The Olive Branch at Clipsham and The Red Lion at Stathern as well as the elusive Mrs Luard who sadly didn’t show up. Consequently instead of splitting into two teams of two and tackling 18 odd pies between us, the three of us had to tackle all 37 pies. That’s right today I’ve sampled 37 pies from football grounds around Britain. This class was open to any baker or butcher supplying any football ground. The pie could me made up of any ingredients as long as the finished weight was under 600g. They were to be judged hot – Game on. The tasting was all done blind, but our winner turned out to be a steak and potato pie made by J.W Mettrick and Sons for Glossop North End. It was a cracking pie, although there was a great chicken curry entry, and a fantastic steak and ale one in which you could really taste the booze but sadly let down by poor pastry. A great day though, well organised and held again in St Mary’s Church in the centre of the town. This year all entries were judged in the church itself, will the pews cleared out. Though there’s not a religious bone in my body is was nice to see a church being put to use like this, smelling of warm pastry and festooned in bunting. Supreme pie of pies went – again – to Walkers Charnwood Bakery, and Elisabeth owes me a pack of Rennie. Brilliant stuff! I am in awe of your stomach capacity.